4 pairs of socks and a lone sock without a match have been knit this month. It has been a long month, and I feel pretty good about ending it here. I’ve got other great stuff to work on anyhow! I am eager to get back into knitting that doesn’t involve socks, and use my sock knitting as icing on the cake. The final pair is the March mystery sock. 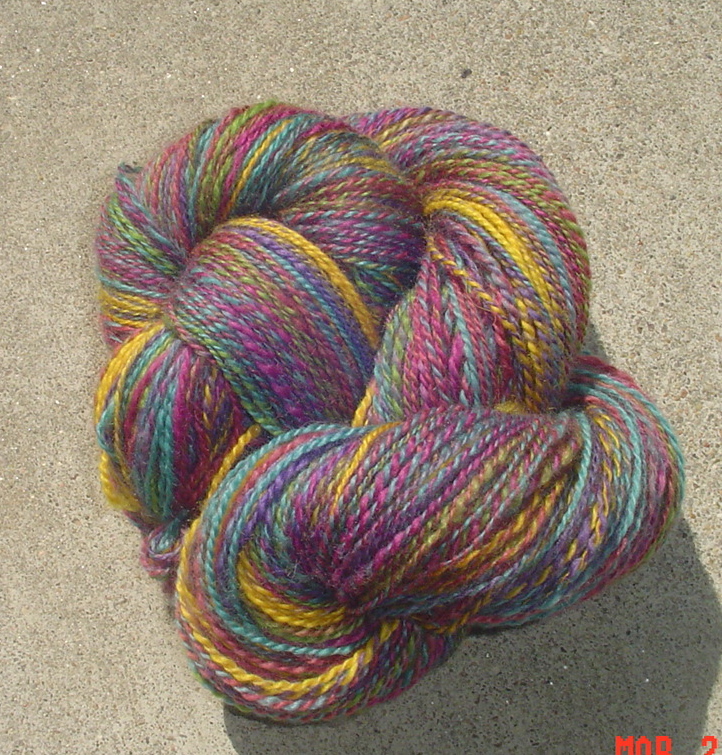 The yarn is creatively dyed luxury sock yarn. Quite a lovely sock really, but a bit large with all the lace. I am satisfied with them though. This years month o’socks went much better than last year. I will most certainly be doing it again next year, as it really does help to bang out a bunch of socks all at once. Not to mention using the pretty patterns and learning new techniques. Another real serious win fron Vintage Socks. My final pair are done through the gusset decreases, so they should fly right along now and be done by Wed. night. In other news, my brother and I cleaned out my basement. What a job! What a dirty dirty job. I now have about 1/3 less stuff in my basement, and empty bins. We already took a load to goodwill, and I have one more load to take. I also have a load or two of stuff for friends with younger kids. What a relief to have all of it sorted! Sadly I feel a little yucky tonight, I am sure it has everything to do with breathing in dust. I won’t blog again this weekend, I plan to enjoy the last two days with my family as thoroughly as I can! My mom and brother are in town, so I’ve not had much interest in posting. The amount of knitting I’ve been doing is a bit low too. 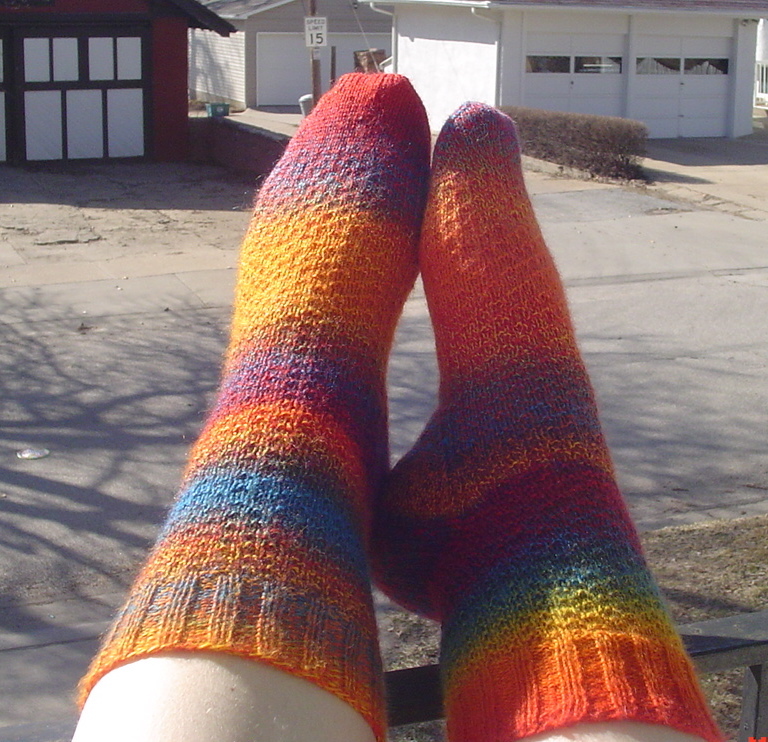 But, I do feel inclined to remind you that month o’socks ends on Wednesday and I have 2 pairs left to complete! 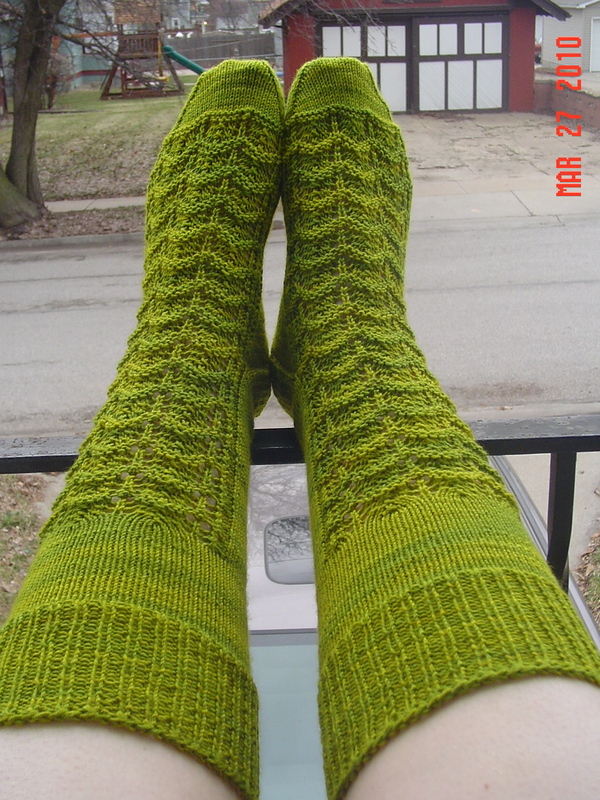 To keep month o’socks fresh, I decided to do one more pattern from the Vintage Socks book. This is the Gentleman’s socks for evening wear. 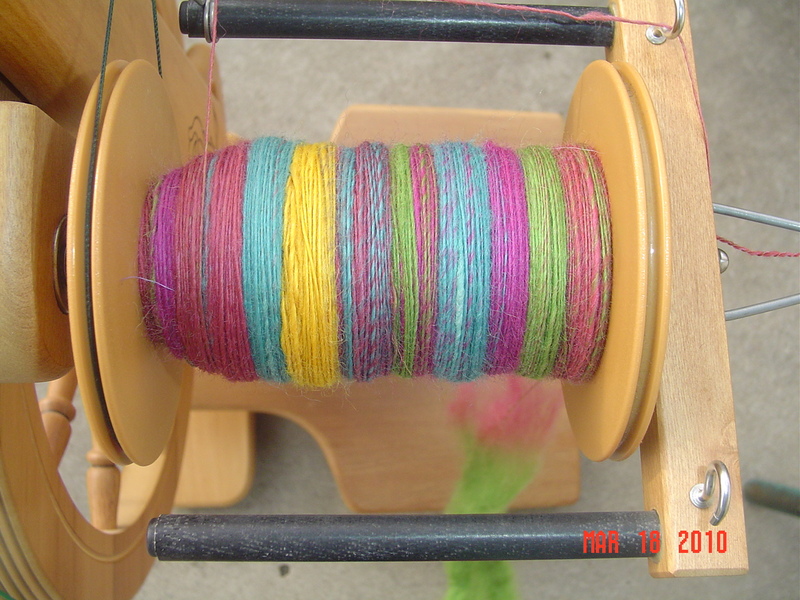 I chose Wollmeise 80/20 in Frosch due to its bright springtime flavor. I am enjoying knitting some longer socks, they feel fantastic on my feet and they fit well under boots. Unfortunately, all this hard work may not pay off overly well until next winter. But it will be nice to wander into my stash of socks and know I have ones which cover my calves. After this pair is done, there is one more pair I am working on. I’ve been working on them this entire month, but since they are mystery socks, I decided not to show them until they were complete. Once those are complete, I’ll have finished 4 pairs of socks in a month and I will be more than ready to work on other projects. I did mention how much I disliked my latest pair of socks yes? I still can’t put my finger on why, it is a yarn I love, in a weight I love, in a color I purchased for a reason. No pattern issues, that was pretty too. I just didn’t like them. Fortunately for me, I have knitter friends who sometimes feel the same way about their socks. And sometimes, that happens at an opportune time, and the stars align just right and a worthy trade is born. So Orangekathy was working on some zauberball crazy socks. 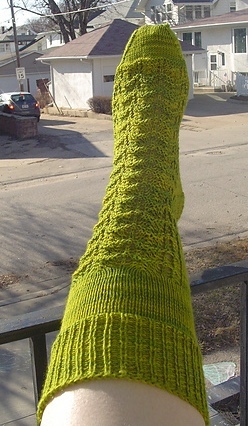 I knit with this yarn once and decided I wasn’t going to do it again, even though I loved the look of the socks. I warned orangekathy, but the colors called to her (in particular the color orange, who knew?). So she went for it, and became so frustrated she could barely look at the socks by the time she was done. Know what? I can look at them. I can wear them. And I can give them all the love and care they deserve! With month o’socks. The problem of hand pain. I thought it was ok, but when it starts to wake me up at night, I realize it is time for a break. This really is a sunshiney looking yarn, it makes me quite happy. The BFL was a bit more fluffy than I anticipated, but it spun very nicely. I am taking it easy with the socks, but I do hope to complete another pair before the end of the month. In the meantime, you may see more spinning from me. Now to go hang up that hank of yarn, it is still wet! Today we have 60F weather. We have sunshine, we have little children riding bikes, running around, and making tons of noise. And we have me spinning on the front porch. Because that is what spring looks like to me. I will make little mention of the snow we are supposed to get tomorrow and Saturday. But it hardly seems fair.